I designed this Bible and Prayer Journal printable because I am tired of being spiritually scattered. I have prayer requests written in my planner, on scraps of paper or my favorite–tucked away in my mind so I can “remember” to pray for or about it later. My Bible notes share the same chaotic life as my prayer requests and intentions. If I had to show you my spiritual life on paper, it would look like half written in spirals, multi-colored sticky notes, calendar, planner, and book margins, and the occasional age-old record keeping system–the back of an envelope. Not that there’s anything wrong with any of those if they’re working for me. But none of them are working well as a discombobulated means of recording my spiritual life. But why keep a record of our spiritual life anyway? Well, we write down things we want to remember because they are important–birthdays, appointments, recipes, quotes. The Psalmist states, “Let all that I am praise the Lord; may I never forget the good things he does for me.” (Psalm 103:2) and “But then I recall all you have done, O Lord; I remember your wonderful deeds of long ago.” (Psalm 77:11) I know those two verses don’t say a thing about writing anything down, but if I don’t write something down, I’ll forget it before the day is over! I want to remember the way the Lord has moved and worked in my life and the lives of those who have trusted me with their prayers, so, I write it down. But, writing it in the margins of the closest calendar, book or spiral, various sticky notes or the back of an envelope isn’t doing me any favors. Not being able to find them later when I need them, defeats the original purpose. Just like I’ll miss important dates and appointments, forget my favorite recipes, and can’t recall certain words of comfort, inspiration, or instruction from something I’ve read when I need them again if I don’t take the time to record them. And then there’s the gratitude section. Just as important as “Please” and “Help” and maybe even more, is “Thank You.” If you take the time to Google the effects of gratitude on our mental, emotional, physical, and spiritual well-being, you’ll realize there is even evidence based science to support the daily practice of writing down what we’re thankful for. There are 24 designated slots per week. If you were to only fill in those 24, by the end of the year you would have a list of 1,248! Now, you know how when you’re reading the Word and the Holy Spirit gives you a nudge? Or a good, solid “Whack!” And you think, “Oh, that’s good God, I’m going to remember that!” And then we don’t. Look, we are busy and our minds are going in so many different directions every day that if we don’t write these spiritual inspirations down, we are likely to forget them sooner rather than later. There’s an entire page to take notes, doodle, draw, journal, create, whatever and however. There’s a place for you to document how you and God spent time together during the week. 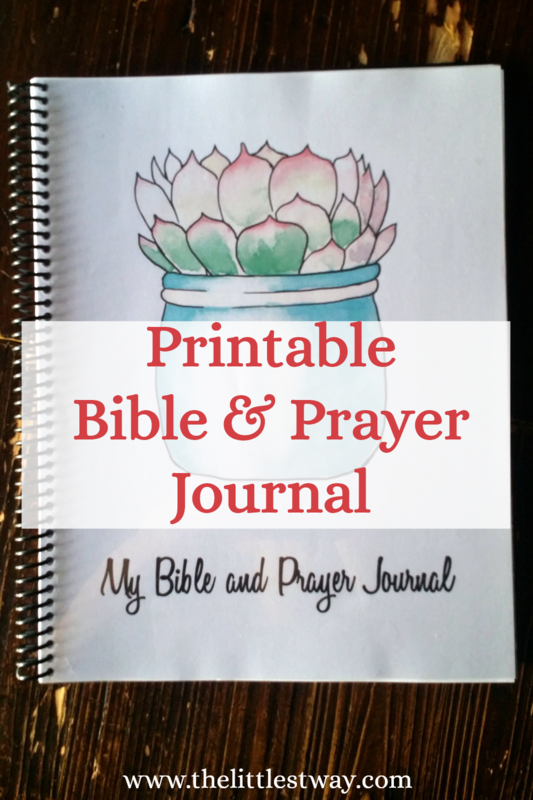 I designed this Bible and Prayer Journal printable to be simple, easy, and inexpensive. I think the simple and easy part is pretty self explanatory. But let me tell you why inexpensive. I love journals. Love them. The prettier the better. But once I get them, It’s like I’m afraid to mess them up. 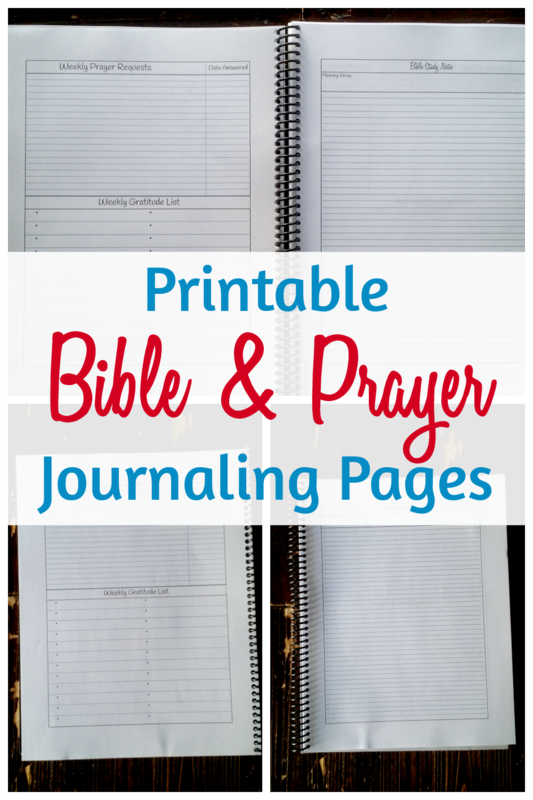 These Bible journaling and Prayer journaling pages are meant to be used, no, loved. Coffee spills? No problem! Baby drool? a great reminder when you pull this journal off the shelf or out of the closet years later. Toddler art? Perfect! Keep this journal with you where you pray and read. And if worse comes to worse, just reprint. It’s not dated so it can be used over and over. I know you’ll love these pages so let me know when and how and where and all the details when you start sing them. And quickly, here are some links to my favorite pens and highlighters just in case you need some to get started.